Images and text have been combined for centuries to present information more succinctly. In the 1800s, designers started combining maps and charts in innovative ways. They often illustrated problems in social science and politics, such as the proportion of war casualties from different causes. 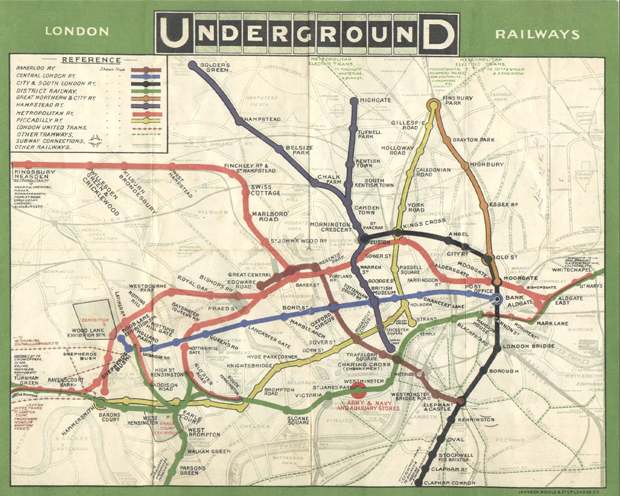 Urban planners also used them to create better maps, as shown by this early London Underground map which makes use of color coding. The infographic as we know it took shape in the 1990s. As software became more common, it was easier to design charts and graphics that were educational, and also fun. In the past decade, with the rise of the social Web, searches for infographics have exploded. The Wikipedia article “List of U.S. states by date of statehood” contains two well-designed infographics. One is a map, shown below, of U.S. states color-coded by the date they joined the Union. The other is a dynamic map and timeline showing the westward expansion of the United States in real time. Although the text list gives the same information, the infographics are easier to consume at a glance. While anyone can take some data and throw pictures at it, making a visually arresting infographic requires following some best practices. Improve your infographics by following these tips. Incorporate eye-catching visuals. These are worth going the extra mile for. Sketch out your preliminary ideas on paper, then use a layout program like Lucidchart to perfect your diagram. Pick an attractive color scheme. What’s black and white and Times New Roman? Your college essays might have been, but a visual age demands eye-popping color. This doesn’t mean you have to use a lot of colors, just the right ones to set the mood. A neon infographic will connect with a different audience than one done in shades of pastel. Use font judiciousness. Carefully winnowing the typeface you use for any textual elements of your infographics not only increases legibility, it increases your credibility. Include humor. A good infographic catches your attention—it makes you see an aspect of the world in a new way. Humor is an excellent tool to help your audience shift its point of view. Check out our funny and entertaining flowcharts as examples. Here are three Lucidchart-designed examples of how to make an infographic and flowcharts. Lucidchart has a large number of shape libraries: you can also easily import Visio stencils, drag and drop images onto the canvas, and even paste text from your clipboard! Need input from a colleague or friend? Try Lucidchart’s in-editor chat functionality—or watch as your co-creators make changes right on the canvas. You can click on each image below to open it up for editing! Click on the image to edit it in Lucidchart. This infographic works because it focuses on the specific topic of project management methodologies, employs an attractive and cohesive color scheme, and simple fonts. The color scheme not only adds to the aesthetic appeal, it also helps the user navigate through the chart. Decision points are consistently in blue, while end points are easily identifiable with the mint green color. The dark background adds to the sense of quality and the sharp contrast to the shape colors helps the information pop. Feel free to open this infographic in Lucidchart to try making one yourself, or use this infographic as a template for your own creation. This is a fan-created infographic made in Lucidchart. Flowcharts have become very popular as users shift to becoming more and more comfortable with complex visual imagery. Think of subway and rail maps for busy metropolitan areas: they condense complex, multilayered information into an image you can take in at a glance. Note: Here at Lucidchart, we neither condone nor condemn the use of keytars. Infographics don't need to be be overly complex to be entertaining. 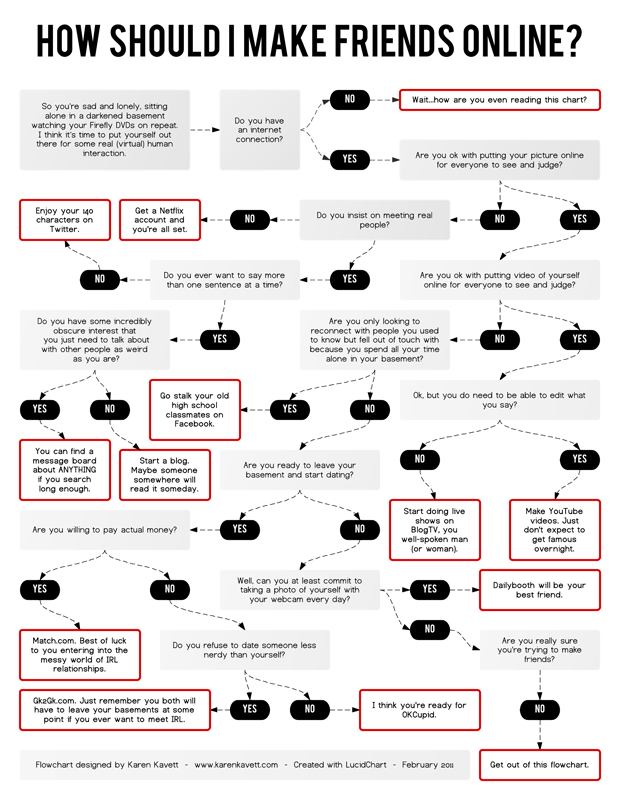 This flowchart uses just one font and one color. What flowchart will you create? Click on the image to modify it. 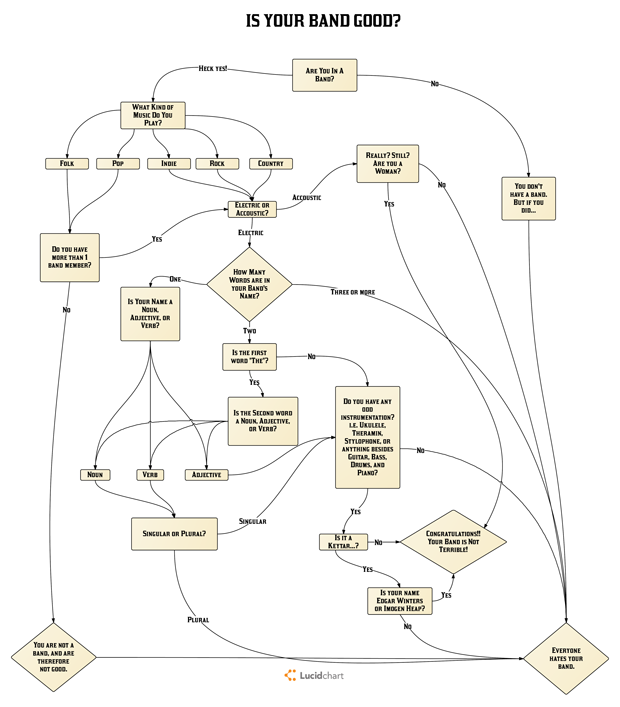 This flowchart, also created by one of our fantastic Lucidchart users, employs a good degree of meta-humor. If you’re reading this blog or use cloud-based software, you’ve probably dipped your toe into the world of social media. Don’t pay hundreds or thousands of dollars for design software if you want to make an infographic for your website, blog—or even OKCupid profile. Try Lucidchart's free flowchart maker: we’ll provide the design tools—you’ll have to bring the clever ideas yourself!